Have you ever noticed how so many cafes have Pumpkin Soup on the menu? Now we’re in official soup season we might see some specials of a variety of different soups but Pumpkin Soup is on the printed, year round menu. In my expert, soup-eating-cafe-crawling opinion there are three main reasons this is so. Like, super easy! At its most basic – you chop up some pumpkin, maybe add an onion, boil it to death in some chicken stock, blend it up and there you go. A dash of cream, a sprinkle of chives and some crusty bread on the side and it’s cafe ready. For the non-adventurous diner, Pumpkin Soup is a low risk order. “Hmm Pumpkin Soup, I wonder what that might be?” It’s soup, made from pumpkins. You know what you’re gonna get. A nice big pot of soup, frozen into individual serves is perfect for a quick buzz in the mickey-groover (aka microwave) ready to serve on demand. Now, I’ve had my share of Pumpkin Soups when working in cafes and looking for a simple, low cost lunch option to fuel my writing. But every time I do, the above three thoughts come to mind. Because 1. I don’t like ordering (or paying for) things I know I could make at home, 2. I enjoy dining out for stretching my culinary palette – give me some Morrocan spices, give me an ingredient I don’t recognise that makes me feel like I’m being a little daring to order it. And 3. I want to see my lunch served from that big steaming pot of yumminess or see a pile of vegetable scraps being scraped into a bin that make me think there may still be some nutrients active in my food. In context to these thoughts – I wonder if cafes aren’t missing the opportunity to show themselves as more creative, current or keen to bring us on something of a culinary journey each time they choose Pumpkin Soup over the myriad of other winter warmers that might be available? A Pumpkin Soup mindset might be easy, familiar, safe and practical – but it’s hardly going to set the cafe world alight or bring any great education or change to the palettes of cafe crawlers. Which made me wonder, where else does the Pumpkin Soup mindset manifest itself? The answer that first came to mind was, “pretty much everywhere” but the thought that quickly followed (associated with feelings of frustration and discomfort) was “in church life; in our faith”. 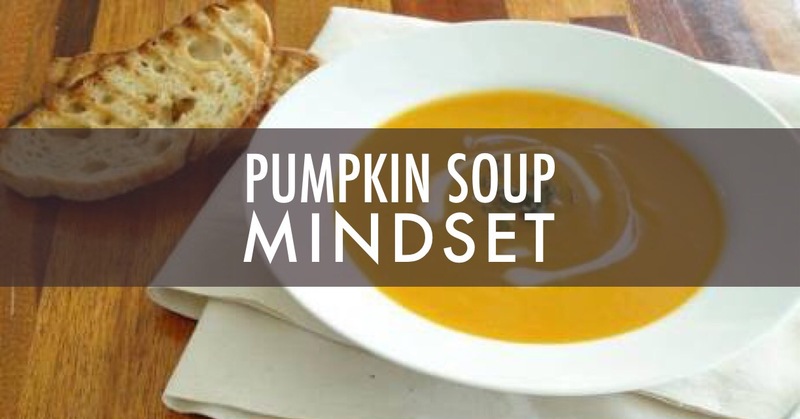 The Pumpkin Soup mindset is the enemy of relationships, church cultures, faith walks, communities and families that we desire to be dynamic, vibrant, thriving and growing. How often are we tempted to make choices based on what is easy, safe and available when none of those things is likely to bring about best outcomes? Where in the call to be a disciple or make disciples was easy, safe and available part of the deal? I’m not talking complicated, unsafe and exceptionally difficult just for the sake of it, but when we’re looking to grow in our personal faith or to encourage our faith communities to greater obedience, greater acts of love and service, greater witness – the Pumpkin Soup mindset is just not going to cut it. Next time you’re in a planning meeting, chatting over a problem with a friend, making a big decision, looking to God for guidance on an issue, choosing a course of action, or seeking to grow in your faith, reject the Pumpkin Soup mindset. Be ready to explore a variety of flavours, ingredients or cuisines – be open to the challenge, the unknown, the extra effort and the faith-required options that God might call you through to His best. If you’ve elevated and communicated the value of church attendance, negotiated and threatened your lips off and offered bribes of every incentive you can possibly imagine but are still struggling to get buy-in from your kids – there’s only one thing left to do. 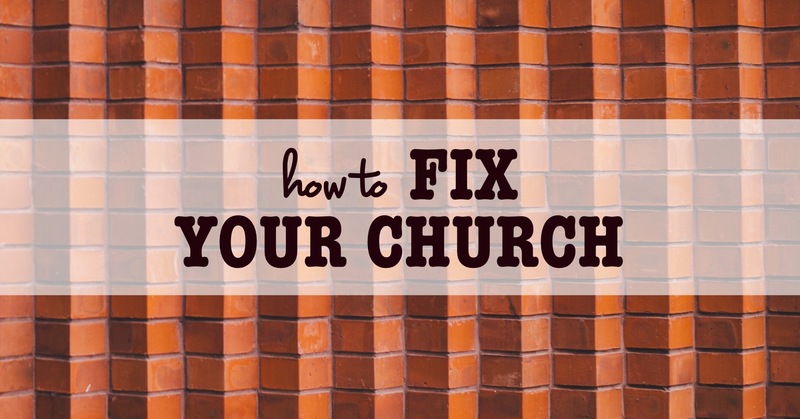 You need to fix your church! You know the old adage about not just identifying the problem but being part of the solution? Yeah, that. It’s time to roll your sleeves up and get involved in fixing your church. It may seem like a big challenge (depending on what your church dynamic is like) but it may take less than you think. Here are some low output-high impact first steps. Passionate, genuine, supportive and committed people who show up regularly and consistently make every/any church better. Whether your attendance almost doubles the size of the congregation or fills one of 60 rows, every person who shows up contributes something vital to the dynamic of a gathering. It may seem a little arrogant to assert that your very presence could improve your church – but flip it over and consider what would happen if everyone thought their attendance didn’t matter and didn’t show up! And as a side note – not surprisingly, your kids won’t be passionate about attending a place that you are not demonstrating a passion for. If your attendance is more about a week-by-week decision based on feelings and schedules rather than an anticipated fixture in your weekly rhythm you undermine the integrity of your desire to see your kids engage. There isn’t a church in the world with the budget to professionalise all aspects of church life. And even if finances allowed it, it would not reflect the church as Jesus declared it or as Paul and others advocated in the New Testament. Pretty much every service your church provides is possible because of the contributions of “someone” like you. “Someone” with skills, time, talents, heart and availability to serve one another – and the desire to see needs met, people connected, God encountered and disciples developed in a variety of ways for a diversity of people. The only way your family benefits from corporate worship, generational ministry, events, and shared faith experiences is because “someone” serves. “Someone” gives their Friday night or their Sunday morning over to teaching and leading – in music and word. The building is physically ready and you are welcomed because “someone” comes early to prepare for you. Small groups happen because “someone” opens their home. Morning tea is served because “someone” sets up the urn and packs away afterwards. Again, if everybody thought that they didn’t need to contribute you would show up to a very different kind of service, in a very different physical space and ultimately be paying for some very expensive psychiatry bills for your burnt out Senior Pastor! It’s not rocket science. You need to give something for the system to work. All people thrive under the intentional investment, discipleship and encouragement of others. In any church environment there are going to be specific people who have influence over your child/ren. They may be positional influencers – those with the title of “leader” or “coordinator” in specific departments or ministries. They may be proximity influencers – those they’ll serve next to or find themselves spending time with. Or they’ll be influencers by personality – that cool young adult that everyone gravitates to or the super caring and connected person whose name your kids remember and repeat most often. If you want to spend your fixing energy wisely, direct it to the influencers. If, by your investment, care and counsel, you can help an influencer flourish you will be influencing your own kids through them. You will be making the church a better place for them (and others in kind) to connect to and thrive in. Invite your kids’ youth or kids ministry leaders for dinner or to birthday parties and basketball games. Host their groups in your home. Pray for them. Know them well so as to be able to assist them best. You can fix a lack of leadership or develop the competency and confidence of leaders by your intentional encouragement and support of those who God has appointed and who stand to impact your child’s sense of belonging in a faith community. Again, they’re simple steps but also essential. I am constantly surprised by the number of people who will speak of their disappointment in them or their families not finding a place of belonging, connection or support in a church community and they haven’t tried any of these fixing tips. They’re certainly no guarantee that your child will grow to love God and church – but their absence has a far greater likelihood of assuring the opposite. Parents will sometimes talk to me about the struggle it can be to get their young people to church. 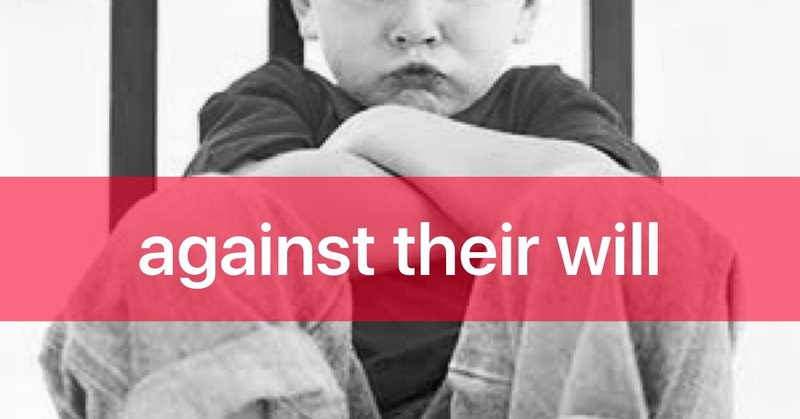 It can be hard for a whole range of reasons – tiredness or sickness, insecurities or relational tensions, ‘boredom’ and the lure of other events (sports, birthday parties etc). But parents can also be faced with resistance to church attendance as a child starts to gain (and fight for) degrees of independence and particularly as they transition from a church’s children’s ministry into “adult church”. I don’t believe the importance of church (a gathered community of believers) attendance can be overstated. Many would posit that they can ‘do faith’ without regular church participation or aside from meaningful engagement with a faith community but my understanding of the place of the church in God’s plans – as well as research and anecdotal observations over many years – tells me otherwise. One Easter my brother was having a chat with his young son around Communion. They talked about the bread and the juice and he was most pleased to hear my nephew able to recount that they represented Jesus’ body and His blood. “And what are they to remind us of?” he asked. Easter presents a similar dilemma to Christmas – where the commercial version of the celebration has moved so far from the original event that making the links, particularly for young minds, can be a challenge. “Jesus died on the cross to forgive us from our sins … and … so we can have Humpty Dumpty themed chocolates and a camping trip with our cousins.” You can see how that might be problematic. The events of the ‘Easter’ weekend are what Christianity is all about! The fact that the God of the universe became flesh in the form of Jesus Christ, lived on earth, died a torturous death on the cross (for OUR sin) and then rose to life again is THE story!! Everything we know of God, everything we experience of relationship with Him and the security of our future in Him was made possible by the true “Easter story”. As with Christmas, the commercialisation of the event comes with some great perks. There’s lots of chocolate! There are hot cross buns! There’s a long weekend! But the obvious caution is that we can lose something significant if we don’t counter that message with the message of Jesus. There are lots of ways to get intentional about communicating the REAL Easter message to our young people. I’m sure many of you have some super creative ways to do that or some simple but tried and tested methods and traditions. It matters less HOW you do that and more that you just do! Prioritise church (Friday AND/or Sunday) and take the opportunity to invite friends and family along, read the Biblical account of the Easter weekend (there are lots of kid/family-friendly versions available), take time to reflect on the significance of Jesus’ death and to celebrate His resurrection. “12 thoughts of Christmas” #9: It’s Tradition! Yesterday as I was at the supermarket getting last minute cooking supplies, I saw a packet of Christmas lollies that made me smile. They’re often called “traditional Christmas mix” or something similar and they only seem to come out at Christmas time. I smiled because I’ve had those lollies at pretty much every Christmas I can remember. There were a few loose ones in the bottom of our stockings (that we always ate before breakfast – which sounds like a great idea but always left me feeling a little weird) there were bowls of them around the house – they were like the official treat of the ‘we can eat lollies at any time today because it’s Christmas’ rule! I associate them with my Grandparents (who died before my 12th Christmas), which is a lovely memory too. Traditions are important to creating a family history. They form part of the shared story that undergirds family relationships – between parents and children and also amongst siblings. Traditions are an important part of our development as children and are formational in our understanding of who we are and where we come from. On Facebook these past weeks I’ve seen pictures of some great family traditions. From stringing popcorn and cranberries for an edible decoration to visiting the Myer Christmas windows, from a crazy late night shopping expedition to walking the neighbourhood to see the Christmas lights. A gingerbread house decorating competition, a picnic at the Carols, cricket matches, funny Kris Kringles, friends gathering for a BBQ and writing Christmas cards. All of these traditions are so fun to revisit and bond families and friends in love and memories. Let us know what you do! What traditions do you honour every Christmas time? And of course, let attending church together be one of those traditions too.